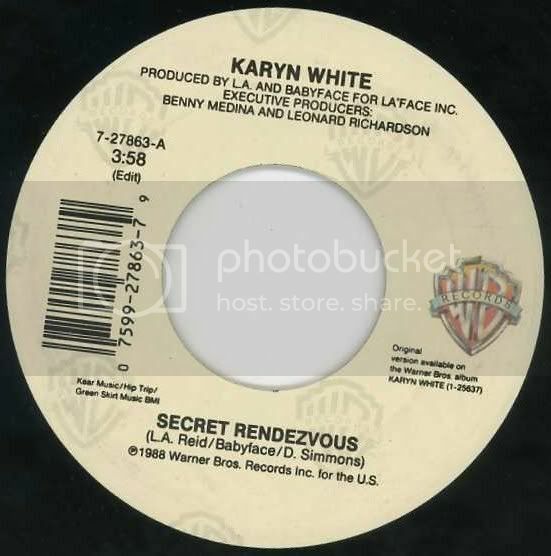 Top 40 Music on Compact Disc: Karyn White - "Secret Rendezvous"
Topic: Karyn White - "Secret Rendezvous"
Keep the first 7 beats from 0:00.0-0:03.9. Edit on snare with handclap. Remove the 8 beats from 0:03.9-0:08.2. Keep the 25 beats from 0:08.2-0:21.7. Remove the 16 beats from 0:21.7-0:30.3. Keep the 224 beats from 0:30.3-2:30.6. Remove the 16 beats from 2:30.6-2:39.2. Keep the 88 beats from 2:39.2-3:26.4. Remove the 16 beats from 3:26.4-3:35.0. Keep the 35 beats from 3:35.0-3:53.8. Remove the 16 beats from 3:53.8-4:02.4. Keep the 45 beats from 4:02.4-4:26.6. Edit on the downbeat on the syllable "voo" in "rendezvous". Remove the 80 beats from 4:26.6-5:09.6. Keep the 32 beats from 5:09.6-5:26.8. Put a 32-beat fade from 5:09.6-5:26.8. Your mixdown will run 4:05.1, with edits at 0:03.9, 0:17.4, 2:17.7, 3:04.9, 3:23.8 and 3:47.9, and a 32-beat fade from 3:47.9-4:05.1. There's an insignificant pitch difference between the commercial 45 (about 111.9 BPM) and the CD (about 111.7 BPM), so if you're the ultimate stickler for detail, you'll want to pitch up your mix by 0.14%. That is kind of odd. Warner was certainly still making picture sleeves at this point, and Karyn White had a couple of big hits under her belt. You'd think this single would have had one. Does anyone have the cassette single? What does its cover look like? fade than the 45 version?